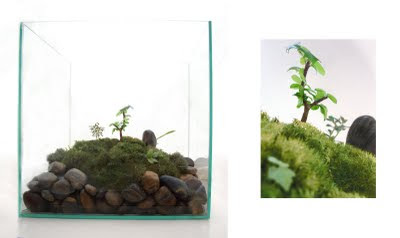 Look at these stupendous terrariums by Jeff at his blog http://jeffnycity.blogspot.com/. The aesthetic is spot on with natural plantings in complimentary containers. The top photo is a "wild" styled terrarium with a natural planting arrangement featuring a flowering Oxalis Silver & Gold. 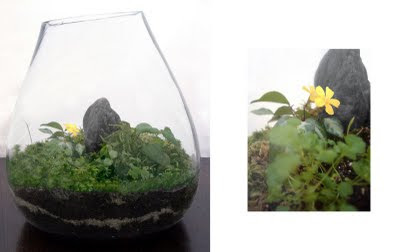 The second photo is a terrarium in a zen-style planting and I have to agree- it is very zen-inducing. Jeff will be selling his terrariums on Etsy and Ebay soon- check back at his blog frequently to stay updated! Wow, that is simply gorgeous! Just like a little island. i love the use of sand and rocks! so adorable. i just made a couple a terrariums on sat. so much fun, and so cute! What's so great about Terrarium Containers is that they can be so easy to take care of since you don't need to water them very often. Most of the time if you're a beginner you can even get one that is pre-planted and ready to go.